Extremely Dangerous Storm Slicing Towards Alaska | Watts Up With That? 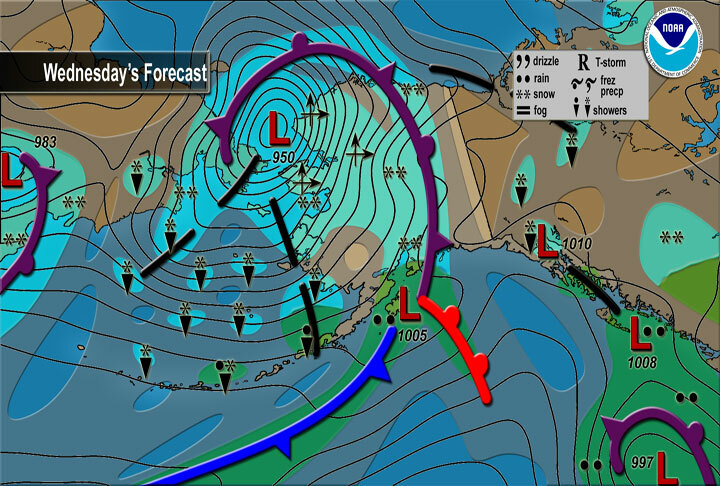 An extremely dangerous storm is slicing toward northwestern Alaska and is expected to bring blizzard conditions and hurricane-strength winds to the state’s west coast. The storm, which formed from a mix of air masses over an area of ocean prone to spinning up strong storms, could be bigger than anything ever seen in the 49th state, the National Weather Service warned. The storm is the product of warm air in the Pacific Ocean tapping into the cold air off Siberia, picking up speed in a jet stream near there and then intensifying as it moved into the Bering Sea – “a place where storms typically intensify,” Brader told OurAmazingPlanet. The weird storm has an unusually long fetch length, which is the length of the wind blowing in a single direction over water. In this case it’s maybe 1,000 miles (1,600 km), Brader said. To envision what a long fetch length will do, think about blowing wind with your mouth over a bowl of water; the water piles up at the opposite end. The same thing happens over the ocean. The stronger and longer the fetch length, the bigger the waves it will create. The winds from the current storm will push high waves ashore and create widespread coastal flooding and severe erosion of the coastline, the NWS warns. Sea levels could rise as much as 10 feet (3 meters) above normal in the Norton Sound and along the Bering Strait coast. Has “slicing” got a special meaning with view to how a storm is approaching, e.g. angle/speed, or is this just another way to say “it’s coming”? does this count? We’ll never know if someone “in the discussion” attributes the storm to CAGW, but there’s an evens chance. Even if sea ice was at normal levels, there wouldn’t be much sea ice in that area this time of year anyway. Many will claim that this is caused by CAGW especially the Democrats who seem not to be able to think of anything else. nice big scary story for almost the entire New Zealand population and its insurance industry! One of main impacts of rising sea levels for the region would be extreme weather events such as storm tides, especially on low-lying areas of the central business district and suburbs such as The Wood, he said. Dr Bell said rises of more than a metre could not be ruled out, and should at least be considered. 65 per cent of NZ’s communities and major infrastructure are within 5km of the sea. It looks like the image link in the main article has expired. Here is a link to the latest UW MM5-NAM 36km Domain, 72 hr forecast loop showing projected weather conditions in the North Pacific up to the southern half of Alaska. I believe this link is being updated twice a day. During the update process, loops may be incomplete as it usually takes several minutes to generate each new frame hot off the computer. Ah, I’m not the only one who found the /progressive/group/think link. Excerpts follow. Bold added, which only emphasizes how this “article” is so ridiculous/pathetic as to be self-parodying. In 2008, Kivalina sued Exxon Mobil and other top carbon polluters because climate change is destroying the village. In 2009, a judge dismissed the case, saying the damages are a “political question.” The case is now on appeal. Open question: Why doesn’t Joe Romm (of the former stand-alone Climate Progress blog) have the byline? Were the claims that were to be included too preposterous for even him to stomach? Ach… all this excitement and the Barrow Sea Ice Webcam is not updating. I don’t know about who’s going to claim this storm for climate change but here’s the FEMA page for Alaska weather history and there’s quite a few ‘severe storms’. If there was sea ice, then ten foot storm tides would lift it, and hurricane force winds would grind it ashore. It would in no way “protect” the shore. In fact, when storms produce on-shore winds and the Great Lakes are frozen, the ice on occasion can snip shore-side trees like scissors cutting hair. There is a video of ice grinding ashore on the North-slope coast of Alaska, somewhere. As I recall, human structures of metal don’t stand up to the ice all that well. They are probably lucky there is little ice. Ten foot tides are bad enough. Any WUWT people up there? There’s nothing better than having a reporter on the scene. It sure beats having “Weather Channel’s Tim Ballisty” dream up scenarios from a warm office several thousand miles away. I ever-so-vaguely recall watching a video many years ago (pre internet) about a storm that caused waves to hit mountainsides 1/2 a mile high somewhere around… hm, either Valdez or Seward, I don’t remember now. I believe the storm was supposed to have happened before any settling of Alaska, it was all based on damage to the side of the mountain, trees, rocks, etc. Meh I just don’t remember the details. Pretty sure it was a storm though and not an earthquake, such an event from an earthquake isn’t nearly as remarkable. As I recall Bearing storms are pretty common and can be pretty brutal. Don’t there people watch that Dangerous Catch show? 🙂 Anyway, people living in that part of Alaska are pretty tough hombres, I’m sure they’ll make it through. Not to mention there are probably about 1/1000th of the # of people that were impacted by Katrina. The kilometer high “wave” was due to a landslide into the sound. Thus it’d be catergorized as a “tsunami”. If there’s a lack of sea ice (it’s farther north), the storm itself is prb’ly north of where it would be otherwise. So, the US northwest is saved by lower Arctic ice! Also: anything over 100 ft isn’t a wave, it’s a slap. Feminists have a different geography to the rest of us? Does that mean they live on a different planet, or just draw it differently? It’s weather, it’s nearly winter and stormy in Alaska, wow and it’s really mild here in England. The climate is changing again, get over yourselves. Yawn. Sounds like a typical winter storm to me. I lived on Adak for 2 years (1958, ’59). Pretty much expected weather. My prediction: A storm this powerful usually leaves behind a path of water that is 2-3C cooler than it was before the storm. This area will freeze up earlier than usual and probably with a larger coverage area. I wonder if people making sea ice coverage predictions will take this into account. I wonder where this storm is headed after it hits Alaska? I will state the obvious. There is no anthropogenic mechanism that explains this storm. The warm water colliding with cold air is the direct result of left over El Nino warm water that has migrated North, as it always does. The cold Arctic air is a duh statement. El Nino’s, arctic air temps and arctic pressure systems have not been mechanistically connected to anthropogenic causes. And neither have extreme weather events. Period. No researched and peer reviewed article has been published proposing a plausible anthropogenic mechanism. Not one. Any media article that appears to state such nonsense competes with snake oil sales pitches of the past. 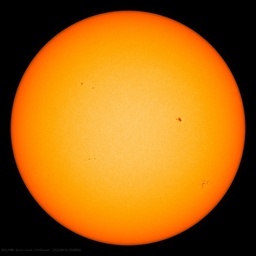 This has gotten to the point that I am beginning to believe this current high degree of global warming religiosity competes quite well with that of the dark ages. Let us work, hope, and pray that we escape its grip on the more feeble and gullible minded folk. 1) AGW has warmed the oceans, therefore providing higher levels of evaporation, leading to more water vapour in the air. 2) AGW has also caused more warming in the tropics than the the poles. This leads to a higher temperature differential between the tropics and the poles, and therefore much stronger storms are generated. 3)These stronger storms (from the stronger temerature delta) combined with more water vapour in the air results in mega storms like these. 4) What makes this worse, is that the AGW warming of the oceans has caused a slight expansion of the oceas. This thermal expansion of the oceans makes the tidal surge much bigger and more devostating. 5) To make things even worse, carbon aerosols (soot) from China have masked these effects and caused a temporary slow down in warming over the past few years. But capitalism, corporate greed, Halliburton and Oil cartels (and George Bush of course) created the GFC which has caused a global financial downturn which has lead to much lower industrial activity in China over the past few years. This industrial downturn has greatly reduced soot/aerosol emissions in China, resulting in the reduction of the “soot” cooling, and a resumption of the warmening. Only our faith and devotion to the enlightened ones (Gore, Obama, Hansen) can save us…. Must be an early arrival of one of Hansen’s granchildrens’ storms. “The Bering Sea has and always will have these strong storms. What is different now is their potential destructiveness as you lose the sea ice cover,” he added. Notice the “as you lose” part, meaning the ice loss is ongoing and implying that it will of course continue. Notice also, the choice of “what is different now”. Different from when? I suppose he means from 40 years ago, but he seems to be implying that sea ice cover has never been this low before. Warmenistas know that by their choice of words, the Believers will get their message. You have to use the correct media phraseology. When the storm reaches the shore line it will slam the coast and be packing hundred mile an hour winds. Perhaps Anthony can recall when this set of phrases became de-rigeur. The problem with your explanation 2) is that the postulated tropical temperature increase has not materialised. The tropics are not warmer than they were before, say 50 years ago. Places like Darwin are cooler, in fact. The warming (guessed by GISS to be in the Arctic) decreases the very effect you claim has been increasing. Points 3, 4 and 5? Fail. The Chinese aerosol idea is total bunk. Don’t repeat it. It is a desperate diversionary ploy by warmists to explain the inexplicable: global cooling in the presence of more and more magic gas. Agreed. It does not seem to have occurred to the ‘ice protection theory’ people that a) ice floats providing no meaningful protection at all and b) having your house hit by a 5 ft thick ice floe is not better than having it hit by a tsunami. Your post, ggm, would be even better if you include mechanisms. How’s this one? Re: warmed oceans. A molecule has been discovered in the soup of ocean salt water that absorbs LW infrared quickly and makes it heavier, thus sinking below the thermocline rapidly. These molecules sink to the bottom of the ocean, loaded with heat (which is what makes them heavier). The warmed molecules eventually find their way back to the ocean top layers (via the overturning circulation) and add heat to El Nino’s, resulting in hotter ones. Here’s what a combination of strong winds and “protective ice” did in my neck of the woods a few years ago. A different planet i think! The occurrence you are remembering was a megatsunami in Lituya Bay, most likely. A landslip occurred near the end of the bay, and put out an incredible wall of water. Similar events occur around Hawaii on a fairly regular basis (though of a long interval). We didn’t have these epic storms before teevee and the internet. This could give some great heavy duty foul weather sailing experience. But the above statement seems to be a reverse as may AGW proponents have stated that the poles are warming faster. One of the science channels had a program on mega tsunamis and included this. They interviewed the guy who happen to be in the bay at anchor to get away from a storm and spend the night. He said he and his son rode out the wave at times to levels of 450 ft. He made this calucation based on the amount of anchor chain he had that played out. What a ride. Whatyra Bay or some such name. Good show and worth watching. It’s an attempt to restore balance between Yin and Yang. All geographical features are portrayed in a way that emphasizes the importance of spaces such as the hollow space that makes a bowl. “could be bigger than anything ever seen in the 49th state,” Ever is long time do they ever as in never ever, or ever as since the 49th state was a state? I have discussed this at length with James Hansen, Michael Mann and the UEA. They have suggested that if you could delay giving me the points for a couple of months they would then be worth 24.7 points. In the North Pacific, shifts from one multidecadal PDO regime to another are associated with the corresponding shifts in the strength of the Aleutian Low. “We didn’t have these epic storms before teevee and the internet. And since Al Gore invented the internet its all Gore’s fault. Finally something that isn’t Bush’s fault. I hope there aren’t any swimming Polar Bears in that area. This post title makes me want to sing “Storm… To Alaska!! !” loudly. Officials in the Northwest Alaska community of Kivalina, trying to dispel fears among villagers as a massive storm bears down on the region, said the city is preparing the school for use as a long-term shelter. The world knows the Inupiat community, clinging to an 8-mile barrier island northwest of Kotzebue, as a poster town for global warming. Fall storms in recent years have swiped away swaths of shoreline that in colder times would have been armored with wave-dampening sea ice. The community received special mention in warnings from the National Weather Service that called the tempest life-threatening and compared it to a blast in November 1974 that hammered the coast. It will have a “severe impact” on Kivalina, the weather service warned. Then, however, the village had its sea-ice protection. Not so today, a reality that’s heightened tensions in town. But Mitchell said the city expects to be safe. The storm is projected to boost seas as much as 8-feet higher than normal. But a coastline rock-revetment constructed by the U.S. Army Corps of Engineers rises 13-feet above sea level and protects essential infrastructure, such as the tank farm, power plant and village school. So this “poster town for global warming” is on a silty small barrier island, barely above the current sea level, which on geological timescales come and go in the blink of an eye, but the recent juxtaposition of low sea ice with fall storms has increased the human-noticeable rate of erosion… Which lead to them concluding it must be the fault of anthropogenic global warming of which the natural recourse is suing “Exxon Mobil and other top carbon polluters” for causing the ongoing destruction of their island. If there’s one thing I’ve learned from the (C)AGW debate, it’s that anything climate-related can be made to sound plausible when there’s enough money to be gained by convincingly claiming it. I wonder how much the lawyers are charging to pursue the case. Heck, I’m wondering who is paying the lawyers, as it’s highly doubtful those villagers could afford suing “Big Oil” by themselves. A very strong storm (then estimated as a “200-yr” storm) hit the region in the fall of 1963 doing a lot of damage to the U.S. research camp located in Barrow and prompted some interesting studies and recommendations in the literature about how local development should proceed in the face of a warming climate. I know this isn’t close to the first but thought I’d pass it along because it is available. Dr. Master’s is indirectly attributing this to Al Gore’s Warming by identifying the climate has changed the amount of sea ice available to slow down the waves. Great humor! Sometimes, when debate is futile, it really helps to reduce things to absurdity. This is the strongest storm in that Alaskan area since November, 1974. The US outbreak this year of F3-F5 tornadoes was the worst since 1974. The flooding in eastern Australia this year was the worst since 1974. The common thread is a strong La Nina in both years. 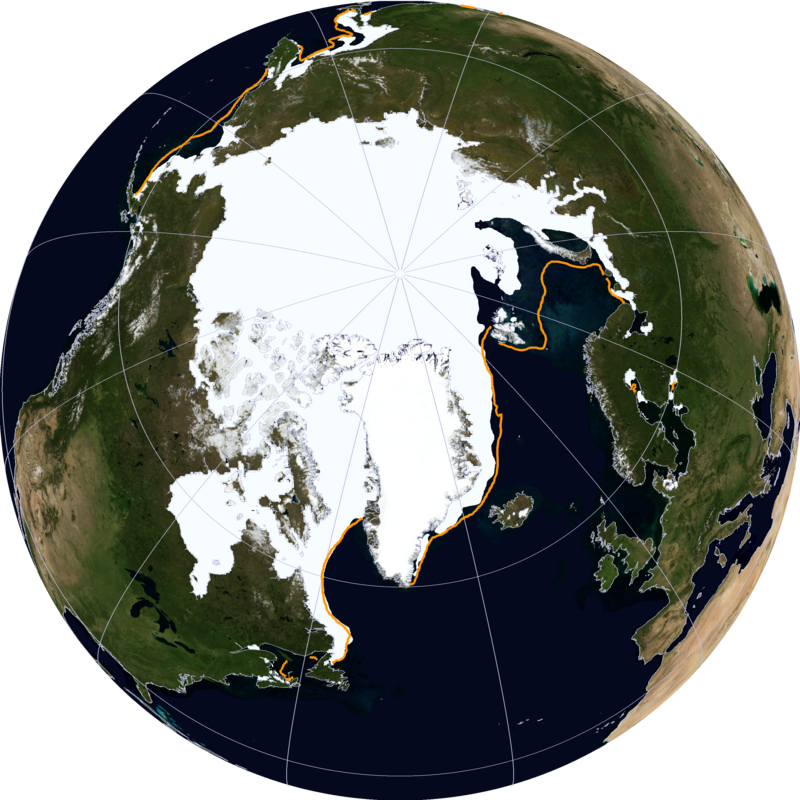 “Arctic sea ice this year reached the second-lowest coverage since satellite records began in 1979, according to the National Snow and Ice Data Center in Boulder, Colorado. Central pressure of 943mb – that’s quite some storm. Seen one or two ‘cyclones’ in the 950s in the UK, but not 943. As for the Katrina stuff, a geo-spatial analysis of those that died in New Orleans showed they were the old and sick and lived close to a failed levee and died of drowning or complications from loss of essential services. In other words, the people and city of New Orleans abandoned their sick and old people to die. A few dozen men in boats and a concerned neighborhood could have saved most of them. Just curious, does Alaskan sea ice behave differently than Great Lakes ice or Chesapeake Bay ice when driven by wind and tide? I know on Lake Superior and in the Chesapeake the combination of high wind and above normal water level (water is piled up by the wind and/or tide) causes the ice to start moving. And believe me, what a sheet of ice miles wide and several inches or more deep does when it piles up on the shoreline is impressive! Ice mounds 10 to 30 feet high where we would drag our aluminum canoes to the top and sled down into the water (or onto the ice if any remained). When the ice finally disappeared, the shoreline would be altered. Bottom line, in my limited experience, shore ice does not protect anything when driven by wind and water. So when I read about ice protecting the shore when a storm like this hits, especially when high water accompanies the high winds, I am skeptical about the knowlege and experience level of the writer. It’s elementary. These storms were frozen in the Arctic ice and unleashed by man’s use of fossil fuels. Do I get bonus points for using the movie plot line, too? Unfotunately, there are more of them and they get to vote. This kind of thing will reverse the shrinking glaciers perhaps. BTW, I haven’t heard a word about shrinking glaciers for about 2 years, or palm trees marching up Kilimanjaro, or Lake Chad shrinking to a kiddie pool, or the drying up of the Amazon basin…. I think its time for someone like Willis to take on this update. “”This is the strongest storm in that Alaskan area since November, 1974. 1974 is one of my analog years for 2011 in my forecast method, on the 13th of November, 2011 the lunar declinational position is at maximum North extent, which IMHO is driving the crest of the storm as the result of production of the lunar tidal bulge in the atmosphere. Bangladesh used to be devastated by cyclone storm surges. e.g. Estimates of up to 500,000 people lost their lives due to the 1970 Bhola cyclone storm surge. The range of knowledge in the comments here never ceases to amaze me! The PDO was also at a relative low in 1974 when another dangerous storm hit in Alaska. I do wish there were more discussion of the ocean cycles at this site. I was in Alaska in the 1960’s. I was very interested in the fact that ships with cargo for Nome would anchor 10 to 15 miles off the coast and transfer the cargo to low draft barges to be brought to land. There was a very shallow shelf which extended offshore. The celestial tide was only about two feet peak to peak, but ships which could have reach wharves at normal conditions did not try since it took only a mild offshore breeze to cause a wind tide of several feet. I was told that wind tides of +- five feet were very common. I did not spend much time in Nome, but in Teller (about 70 miles up the coast from Nome), I saw a drop of over three feet in a few hours in what I thought was a moderate wind. I suspect that a prediction of a ten foot change from a major storm may be very conservative. Sorry if someone has already covered this, but could this Alaksan super storm have any connection with the recent “tilt” and rift in the IMF (not the International Monetary Fund) from a couple of days ago? The one that allowed all that solar wind in that created a lot of auroas? I believe ggm was being facetious. What is particularly funny – at least in my opinion – is that the arguments he lists are pretty much those given by all of the people who say we are going to see more severe weather events. That is about the extent of their science. Violent weather is attributed to a cooling planet. Cold fronts are more violent in their passage than warm fronts, at least so far as I have seen. But this storm is a big, very powerful storm. As to the “lowered ice levels”- I don’t recall that sea ice forms as far south as Nome by November… I think it is usually way to north, north of the Bering Strait. Nome faces the northern Pacific well to the south of the Bering Strait. Anyone have the ability to check on this? If I am right, it looks like global warming bias, that pseudo-religion of this day and age – carries the hysteria factor on this report instead of addressing the REAL problem – that a lot of people are in danger from a severe storm, and would probably need to evacuate before it arrives. Adak island during the early cold war, must have been interesting. ftp://ftp.ssmi.com/msu/monthly_time_series/rss_monthly_msu_amsu_channel_tlt_anomalies_land_and_ocean_v03_3.txt The October anomaly was +0.089. I’ve listed the 12 values for 1995, and the 10 values so far for 2011. If the next 2 months (Nov+Dec) average lower than +0.139, then RSS for 2011 will be cooler than RSS for 1995. Similarly, if Hadley Oct+Nov+Dec anomalies average lower than +0.335, then Hadley 2011 will be cooler than Hadley 1997. We’re talking the other side of 1998 in both cases, which might wake some people up. Time to do some beachcombing in Alaska ? You are right in regards to sea ice not being as far down as Nome in November. Looking at the anomaly chart for the Arctic ice then it is a fair bit north at this time of year. Yet another example of what lowers google rankings. This article is probably 20:1 cut & paste from another website vs. original content. The ice protects the coast in much the same way as a bulldozer protests a building it travels through. @Richard Holle….a rogue wave from a rogue moon. The approaching storm in the Bering Sea indeed may exceed the 100-year “design storm” intensity, to which standard many coastal structures on the west coast of Alaka have been built. The “mega tsunami” that sheared off mature trees at elevations up to 1700 ft in Lituya Bay on July 9, 1958, however, was caused by a massive landslide at the head of an elongate bay. It had nothing to do with storm surge. By the time the wall hit open water, it was reduced by orders of magnitude. Because of rapid dispersion, it never registered on tide gauges around the Pacific Ocean, as would a true tsunami raised by the spatially more extensive displacement of a submarine earthquake. Stop arguing about it guys, lets just sit back and enjoy the show. The CAGWarmists who patrol Wikipedia in order to remove any entries that contradict their points of view do not always eliminate the research findings that conflict them. For example, the Niigata Prefectural Museum of History reported that Early Jomon sub-period period (Early Jomon (ca 4800-3000 BC) (Hamanasuno, Tochibara Rockshelter, Sannai Maruyama) coincided with an increase in world-wide sea levels and warmer mean temperatures than today. Core samples indicate the sea level was 2-3 metres higher than today; pushing the coastline well inland for the Kanto plain. Then why are 1-2 mm increases/decreases of any import? Water goes up – water goes down. Powerful storms of this magnitude are common at this time of year in the Bering Sea and North Pacific, but this storm is unusual because of its northward trajectory and the lack of sea ice in near-shore areas like Norton Sound off Nome, National Weather Service and other agency officials said. “Forty years ago, a big storm like this would come through and the sea ice would act as sort of a buffer,” said Mark Serreze, director of the Snow and Ice Data Center. I first saw this comment by Serreze Tuesday evening. Of course at this time of year sea ice is rapidly forming, making the difference year to year in when a certain level of sea ice coverage is reached a matter of a couple of weeks, so if “the Bering Sea will always have these strong storms,” it can certainly have them two weeks earlier, when “normal” ice coverage would be the same as today, meaning that we could just as well have the present combination of storm and ice conditions without the small amount of late 20th century global warming (which in any case is not significantly attributable to human activity). WUWT extends the climate news by providing a place where people from all over the world can comment, and also not be censored. It also provides a one stop shop for historical reference. I enjoy participating in discussions or just reading comments from others. They featured Bill Patzert, a NASA climatoligist. In what sounded to me as a “creative” way to edit a damning sound bite, he said something like “Some scientists attribute this to global warming” and that’s where they cut it. …”A teacher at the McQueen School in Kivalina, Emma Knowles, said about 150 people had slept at the school on Tuesday night but that so far power had largely stayed on in village houses. She said there did not appear to be obvious flooding, but that the storm was still going strong. The school was providing food to residents. No worries, one thing I have learned in my life, is that when you are way out in the wilderness your best hope for survival is a strong woman. While we don’t know to what extent global warming is the cause of this storm’s intensity, we do know that storms of this size and intensity do significantly cool the Earth’s climate by transferring ocean heat into the atmosphere and poleward. Then there is the increased albedo from snow as this storm tracks east over land. Next month should see a significant drop in North Pacific SSTs, feeding through into the global number. The gold found on the alaskan beaches was (and is) ‘flour gold’. This is gold dust milled so fine from the glacial river outwashes that is ‘flour fine’. It can be difficult to extract from the sands, but specialized techniques were eventually developed to extract useful amounts. Beach combing on the AK coasts is more likely to find remnant wreckage from the Japanese tsunami than any easily collected gold nuggets. On the topic of ‘Big Surf’, news today of a new unofficial world record for huge wave surfing: A surfer dude named Garrett McNamara rode a reported 90 foot rogue wave. Video links follow. Ride the ‘knar’, AK surfer dudes and dudettes!! The latest UW MM5-NAM 36km Domain, 72 hr computer forecast loop seems to suggest the formation of an Eastern Pacific high-pressure area in position to sweep cold air down the West Coast early next week.